The hanta virus was first discovered in Korea during the Korean War. Approximately 200 military personnel were infected and died from the virus they contracted from water rats. In the spring of 1993 the virus resurfaced in the north west corner of New Mexico. The occurrence of this disease is generally thought to have been brought on by a surge in the deer mouse population due to a mild winter followed by wet conditions and an abundance of natural foods in the spring. It is now considered by the CDC as #3 on the most lethal viruses in the US, preceded by #1 rabies and #2 HIV. 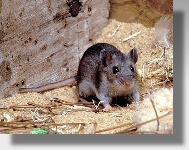 The disease is carried by small rodents including, but probably not limited to, deer mice, field mice, rats and possibly chipmunks. Recent investigations conducted by researchers at Los Alamos National Laboratory indicate that the infected rodent rate in the Four Corners area was approximately 30% in 1993 and 1994. The infected rodent rate in the Los Alamos area was determined to be approximately 8% in 1993, which dropped to 2% in 1994. Other studies around the state are in progress. The disease is transmitted to man through the inhalation or, possibly, ingestion of the feces, urine and saliva or by being bitten by an infected rodent. It is unknown how long the virus stays viable (alive) in the feces and urine, so all such materials should be considered infectious. Precautions: The best protection is to avoid areas where rodents live. During inspections, site characterizations, etc. those areas suspected of having rodent harborage should be scanned with an ultraviolet (UV) lamp. Rodent urine will fluoresce a yellow green color under UV and can be seen easily. These UV lamps are inexpensive and readily available. 1) Wet the material with a disinfecting solution. The most suitable solutions for use are Lysol(t), iodine solutions or hydrogen peroxide, followed by full strength household bleach. If bleach is the selected solution, it is recommend that you thoroughly soak the material twice. The first soaking will bind the high levels of organics and nitrogen compounds in the feces and urine, and the second soaking will provide enough unbound free chlorine to insure disinfection. 2) Once the material has been soaked and disinfected, the wet material should be placed into a plastic bag and burned or buried. All such materials should be disinfected and treated as biowaste when through.